The students at NIT Srinagar campus, which has been gripped by tension following clashes, will have an option to appear for exams later, HRD ministry officials said today. The decision comes a day after a three-member team of Human Resource Development (HRD) Ministry visited the campus to take stock of situation and held talks with the agitating students to defuse the tension. “There are students who want to appear later but a majority of them want to do it as per schedule. So an option will be given to them. Those who want to appear later, re-exams will be scheduled,” officials in the ministry said. The exams are scheduled to start next week. “The HRD team which has gone to the campus will stay there till the exams are concluded. The J and K Chief Minister Mehbooba Mufti has also assured Union Minister Smriti Irani that safety of all students will be ensured,” the officials said. Irani will also be visiting Srinagar on April 13 for a Consultative Committee meeting of Members of Parliament but there is no clarity on whether she will be going to NIT campus. The team which was rushed to Srinagar to look into students’ grievances included Sanjeev Sharma, Director (Technical Education) in the HRD ministry, Deputy Director Finance Fazal Mehmood and Chairman of Board of Governors of NIT M J Zarabi. Tension started brewing inside the NIT campus, located at the banks of famous Dal lake, last week after India lost to West Indies in semi-final in the T-20 cricket tournament prompting some local students to rejoice and burst crackers. This led to protest by outstation students resulting in clashes. Since March 31 night, the situation inside the campus has been volatile and the authorities had posted personnel from Seema Suraksha Bal (SSB). The local police was manning the main gate of the institute. 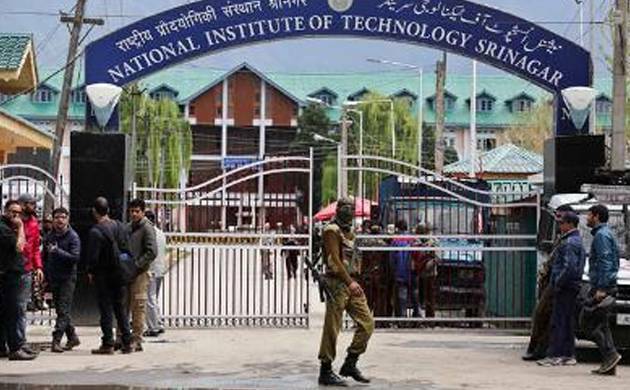 The developments prompted the NIT authorities to close the campus on Saturday but it was reopened on Monday. The outstation students also tried to march out of the campus saying they wanted to return to their homes.